Brick Town Talk: Coco before Chanel - LEGO Town, Architecture, Building Tips, Inspiration Ideas, and more! Los Angeles, California- (BTT) L.A.- The land of the rich and famous. Style. Glamour. Fashion, from around the world- Milan, Geneva, and Paris. 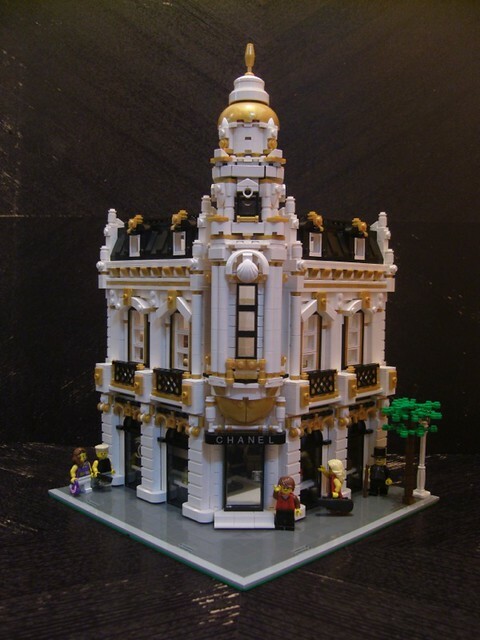 Coco Channel has been a fashion icon for near 100 years now, and so it is fitting that their store gets a beautiful Modular building treatment. The amazing white-on-black with gold overlay colour scheme, the central tower, and the interior are just a few notable high points of this beautiful building. Because, why spend your money down the street at some other fashion store, when this beauty is within your field of vision?